(Palgrave, 2016) vii + 192 pp. Reviewed by Katherine Malone on 2018-04-06. In an era that fetishized the angel in the house, domestic spaces figured prominently throughout Victorian fiction and nonfiction. But Maria Damkjær's thought-provoking study moves past static notions of the home as a mere setting to consider how print culture constructed what she calls "domestic time." She argues that "representation in nineteenth-century print culture, supposedly so eager to show schematization and machine-like efficiency, reveals major uncertainties about how time in the home actually worked" (14). Even as women's magazines and advice manuals sought to standardize and commodify household routines, they more frequently narrated domestic time--that is, the mundane activities that make up middle-class women's lives--through the very "interruptions, delays, or improvisations" they sought to control (2). During the middle decades of the century, Damkjær argues, writers of both fiction and nonfiction began to present domestic time as process rather than stasis; her analyses of realist fiction, periodicals, household manuals, and private albums, therefore, focus on writers' active strategies for representing the flux of passing time. Most interestingly, Damkjær aims to show not just how time is represented within various kinds of serialized texts, but also how "the embodied text in its material format make[s] time" (8). After an introductory chapter on "Timetabling and Its Failures," the book's four chapters treat repetition, interruption, division, and decomposition as unique domestic temporalities. Each of these main chapters explains how time is represented within a text and then widens its scope to consider how the material conditions of serialized texts reinforce or undermine those representations. The book concludes with a substantial coda that reflects on "Scrapbooking and the Reconfiguration of Domestic Time." Chapter one examines repetition as a means of constructing domestic time in Charles Dickens's Bleak House and its accompanying "Bleak House Advertiser." Rather than presenting an idealized domestic space as a background for the novel's action, Damkjær writes, Bleak House obtrusively narrates the repeated actions that produce the household: "the ringing of bells before meals, the rhythms of cooking, account-keeping and supervision, and the small tasks which characters are engaged in when the narrative lingers on them" (23). Though these routines suggest a stable and "easily reproduced household," Damkjær resists stereotyping women's time as cyclical. On the contrary, because the same domestic tasks are narrated repeatedly to the point of absurdity, Damkjær argues that the text shows how "no repetition can ever be perfect, and so repeated actions or events always carry a seed of change with them" (24). But if Bleak House ultimately presents domestic routine as an inadequate defense against the forces of change, the irony of this message seems to have been lost on its advertisers. Damkjær cleverly compares Dickens's construction of domestic time to an advertisement for Dakin & Co. coffee and tea that was sewn into the covers of the novel's original serial publication in 1852-53. As she explains, the consistently formatted monthly parts of Bleak House united readers far and wide in a shared experience that was overtly situated as a domestic activity. The advert--which closely mimics the novel's cover art and was likely drawn by the same artist--capitalized on this conceit to link the repeated private enjoyment of Dakin & Co.'s coffee and tea with a unified national identity. Chapter two, on "Interruption," explores a tautology in the representation of women's domestic time: "they sew because they are interrupted; they can be interrupted because they sew" (71). In this standout chapter, Damkjær examines women's periodicals--including the British Mothers' Journal, Englishwoman's Domestic Magazine, Mrs. Ellis's Morning Call, and Leisure Hour--to show how the "semantic merger of work and leisure--the use of the word 'work' to cover all kinds of sewing--made it difficult to interpret the borders between worthwhile and worthless occupation" (74-75). For example, the magazines' way of using the phrase "spare moment" assumed that women needed something to fill their time, and as Damkjær notes, these periodicals often prescribed needlework "to counter the dangers of unmarked, undisciplined time" (58). Yet, since domestic magazines were also filled with timetables and tips for completing the dizzying number of tasks necessary in a middle-class household, they paradoxically implied that the average woman had no time to spare. Of course, magazines could only benefit from blurring the distinction between work and leisure, for much like sewing, reading periodicals could be justified as a virtuous way to fill a spare moment or fulfill one's domestic work in digesting their useful advice. Chapter three probes a more contemplative model of domestic time in Elizabeth Gaskell's novel North and South, which was serialized in Dickens's Household Words (1854-55). Since this was Gaskell's first foray into serialized fiction, she began to consider dividing it only after the entire book was written. Gaskell's tense negotiations with Dickens are now well known, but Damkjær thoughtfully demonstrates how, in resisting editorial advice to end each installment with a cliffhanger, Gaskell's serial divisions represent domestic time as "a particularly charged version of eventlessness" inextricably tied to psychological processes (21). The central feature of such time is what Damkjær calls "domestic meantime": a recuperative period "between upsetting events, a time when experiences may be discussed, contemplated, and assessed" (86). Within North and South, she contends, domestic time affords characters the opportunity to reinterpret and "sort their fraught memories into comprehensible narratives" (86). Damkjær further argues that Gaskell's serial divisions create a similarly reflective meantime for her readers. This chapter also considers how Florence Nightingale's work in the Crimea influenced Gaskell's view of women's domestic labor as part of a recuperative in-between time. Turning from a serialized novel to a serialized cookery book, chapter four explores the "decomposition" of domestic time in the non-narrative, non-linear format of Beeton's Book of Household Management. Even more than magazines, Damkjær explains, cookbooks offer readers "an endless choice of entry points and pathways" that may be influenced by cross-references within recipes, the scope of the meal or event, or the cook's level of expertise (117). Furthermore, Beeton's is no ordinary cookbook, for this "a-linear writing genre," she writes, "was published in a linear format" (117). The printing plates were set up to make a complete volume, and the content made no allowance for breaks between one installment and the next. As a result, serial publication interrupts the text in odd places--sometimes even in the middle of a recipe, as Damkjær demonstrates with an amusing example: a list of soup ingredients that breaks, ironically, at the word "split," making readers wait for the next installment to find the word "peas" (118). The serialization would also frustrate any reader who wanted to make one of the many fish dishes included in the third installment; though most of these dishes called for "Lobster Sauce," that recipe would not appear until the fifth installment (145). Furthermore, important paratexts like the index and illustrations still had to be inserted once publication was complete, and the final assembled book was oddly marked by the serial's in-text advertising. By lingering on these serial splits and disruptions, Damkjær thus shows how domestic time and serial time "refuse to align with each other" (145). Having begun by considering how print culture tries to order domestic time, this book traces through its four chapters an increasingly unstable relationship between domesticity and print. Appropriately, then, the coda highlights scrapbooking as the triumph of domestic time over the order and linearity of print. Probing private albums from the Harry Page Collection in the Manchester Metropolitan University Special Collections, Damkjær shows how young women borrowed and reconfigured scraps of print culture to create a composite view of domestic time. In one album, for example, a page entitled "Needles" includes a border and illustration apparently taken from other print sources (though the date and origin have been removed), the commercial packaging for a set of sewing needles, and--in the center--the hand-copied text of a didactic poem extolling the virtues of domestic labor and thrift. Recalling her account of how women were told to fill their spare moments with sewing, Damkjær uses this album to demonstrate how the activity of scrapbooking could simultaneously endorse and undermine domestic ideology. Because albums physically represent the domestic time invested in their creation, they suggest an abundance of spare time while still affirming the value of putting that excess time to use. They also challenge standard notions of print time by showing how the date of print materials becomes irrelevant or invisible in most albums. In other words, the domestic practice of scrapbooking uses print matter in ways that can ignore the time-stamp, extending its usefulness just as the skilled homemaker of Beeton's book uses pickling and stock-making to preserve and transform scraps of food. The coda thus highlights one of the greatest strengths of Damkjær's study. By focusing on serialized texts interleaved with other print matter, Damkjær thoughtfully presents print culture as both a fragmented and intertextual experience. Private scrapbooks may heighten this experience because the work of scissors and paste starkly reveals the intertextual reading practices of their compilers, but Damkjær amply demonstrates the ubiquity of intertextual reading throughout her study. Indeed, serialized novels are disrupted not only by the wait between installments but also by intertexts such as advertisements. Magazines, which appear in weekly or monthly issues, comprise heterogenous and sometimes conflicting contents. 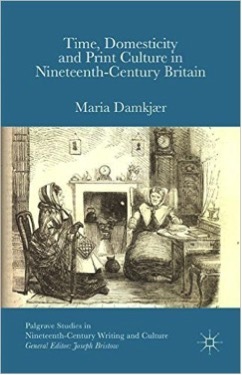 Specialists in the field of periodical studies have long examined the construction of both time and domesticity in magazines and newspapers, and the present study is deeply indebted to the work of scholars like Margaret Beetham and Mark Turner. But even as Damkjær joins two already vibrant scholarly conversations about time and domesticity, she also finds fertile ground at the intersection of these topics. Domestic time, she demonstrates, is a unique kind of time defined by its own conventions of representation in print. In exploring those conventions, Damkjær calls much needed attention to genre, layout, serialization, advertising, and other textual concerns that quietly perform the ideological work of print culture. Katherine Malone is Assistant Professor of English at South Dakota State University. Leave a comment on Katherine Malone's review.